Dear Leader's Daily Thought: We do not torture. and i am doin this to make america safe. so you cant critisize. bye for now. may i be the first to condemn the foolish and arrogant voters of virginia for not voting for republicans last night, depite your personal backing of gubernatorial candidate Jerry W. Kilgore. truly baby jesus will smite them for opposing your will. and be on the watch for the treacherous j.d. hayworth. there are reports that he told liberal flunky imus that he can do without your wise and infallible leadership and support when he runs for reelection in 2006. Keep up the good torcher,...er, work, Dear Leader! Remember, I'm right behind you with the cattle prod. 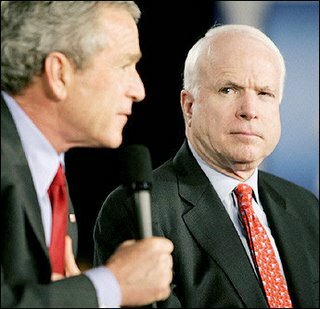 McCain looks like he just crapped his pants. Eating all that crow must add too much fiber to his diet. Lots of molasses and boxes 'o' cornflakes. Several bottles of jungle juice (aka grain alkeehol) with frat boys. March into U-Haul trailer, slather in molasses. Make them roll, under threat of cattle prod, in corn flakes released from said boxes. Drive to "other side of tracks" and release. Monitor phone for lively conversation next morning.